Production designer Henry Bumstead wanted the owner to change the ironworks in front of the red door. Fortunately, it was left intact. 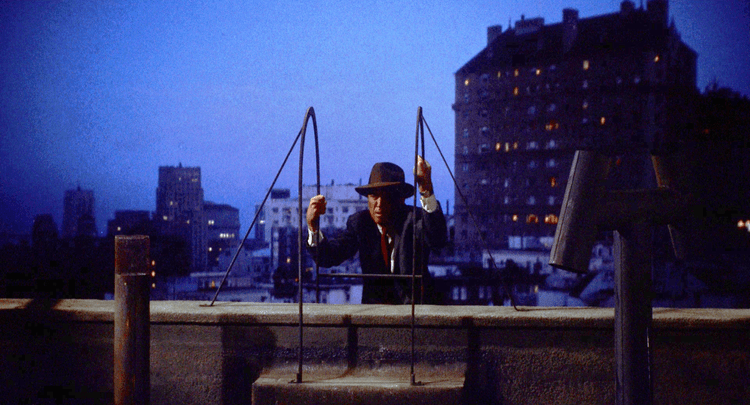 As Alfred Hitchcock’s Vertigo (1958) begins, San Francisco police detective John “Scottie” Ferguson (James Stewart) is chasing a crook. He climbs to the roof in pursuit, stumbles and nearly falls. A uniformed cop falls to his death trying to rescue him. The trauma causes acrophobia, a debilitating fear of heights accompanied by a dizzying vertigo. Scottie makes light of his illness until it resurfaces. 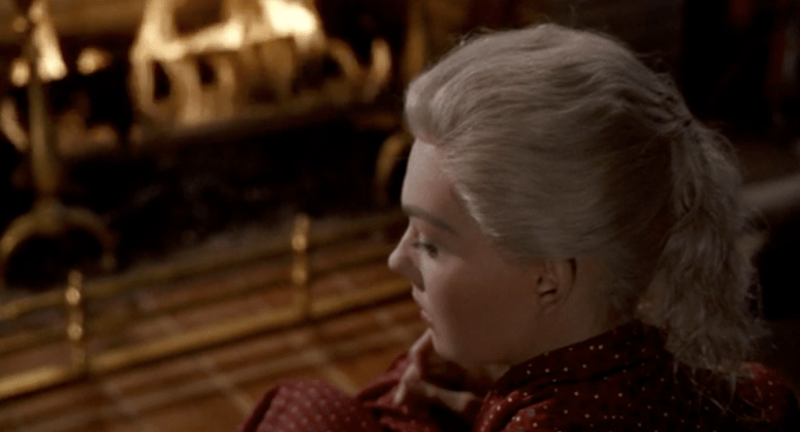 He breaks down in the arms of “mother.” In adapting the French novel D’entre les morts by Pierre Boileau and Thomas Narcejac, screenwriter Samuel Taylor created the character of Midge to have someone for Scottie to confide in and to keep the story grounded. 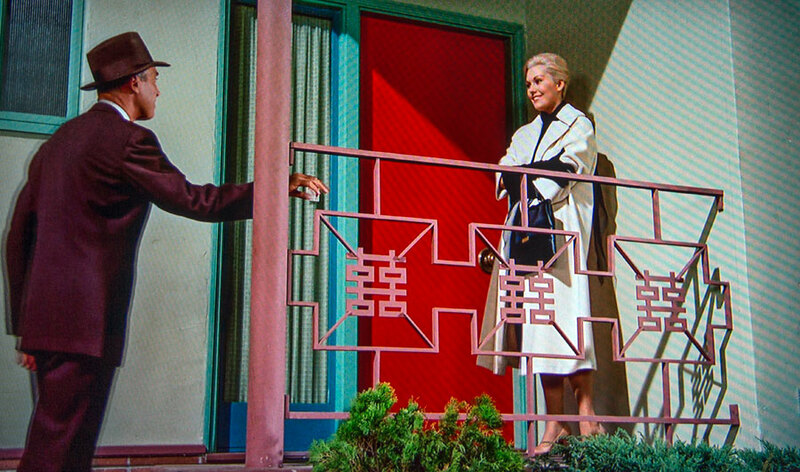 Alfred Hitchcock’s Vertigo, apart from being one of my favorite movies, also has one of the neatest artist studio apartments ever recorded on celluloid. 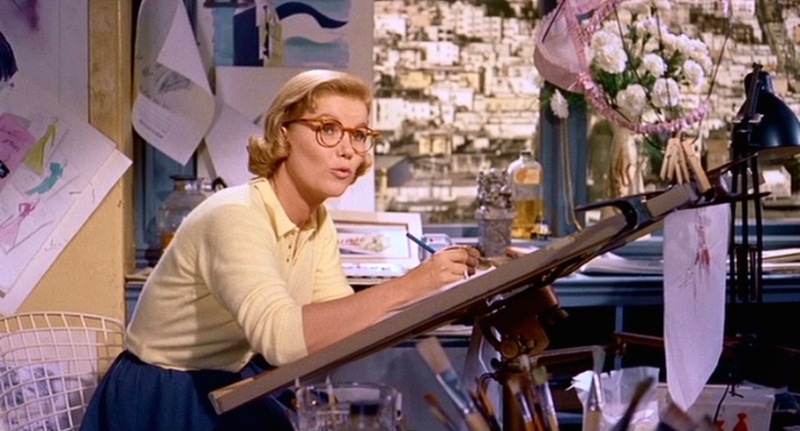 Midge (Barbara Bel Geddes) is a fashion illustrator who lives in a cozy Russian Hill apartment that also doubles as her studio. Among her furnishings are many accessories considered de rigueur for the artist in residence: Bertoia chairs, sculptural lamps, grass window shades, sisal flooring, an assortment of geomentric pillows on a low armless Eames sofa, and the walls in a warm buttery yellow. 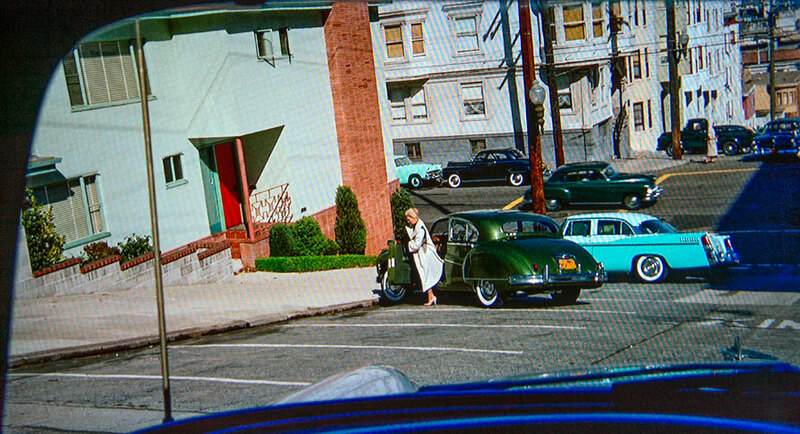 Heck, it sounds like a spread for Metropolitan Home, but remember, this was a set from a movie filmed in 1957. I guess times change, but when you’ve set up a room with classic pieces, it will never go out of style. 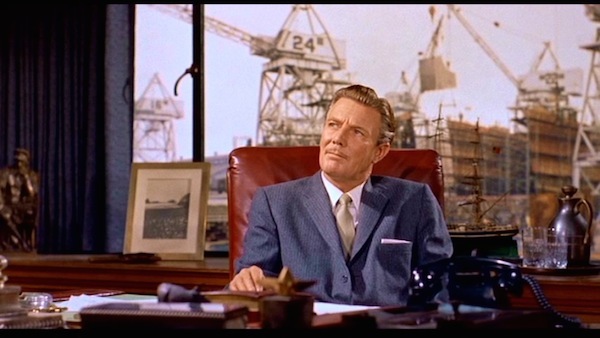 Scottie meets with college chum Gavin Elster (Tom Helmore) at his waterfront office. 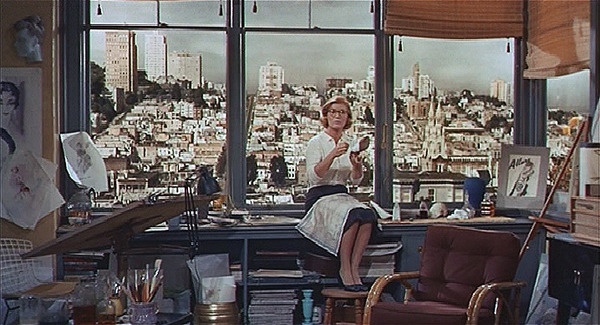 In Hitchcock’s Films Revisited, Robin Wood contrasts “the smart modernity of Midge’s apartment with the discussion about the past in Elster’s office … He has a nostalgia about the past where a man had ‘freedom’ and ‘power. '” The well spoken shipping magnate wants Scottie to follow his wife Madeleine. He doesn’t suspect her of cheating as Scottie first thinks but something more troubling. She’s been having episodes of what appears temporary amnesia. “She wanders—God knows where she wanders,” he says. Gavin wants to know where she goes during these episodes and if she’s in any danger. Reluctantly, Scottie takes on the case to help his friend. What ultimately becomes an obsession begins as a routine surveillance of a wealthy woman. He follows her from her luxury apartment as she drives her green Jaguar sedan through the hilly streets of San Francisco. She ends up at the Palace of the Legion of Honor‘s art gallery. She sits reverently, lost in thought, before a painting of a woman from another age. 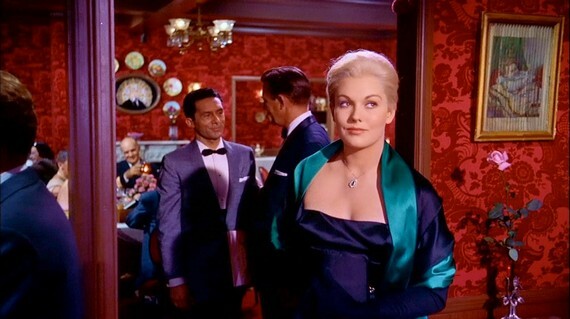 Madeline wears the gray suit that becomes significant later in the film as will the woman’s necklace. Scottie reports back to Gavin at his private club. Distressed, Gavin admits that what he feared most has come true. The woman in the portrait is Madeleine’s grandmother, Carlotta Valdes, who lived a tragic life during the Spanish colonial era. Gavin believes that Madeleine is involuntarily taking on Carlotta’s identity. 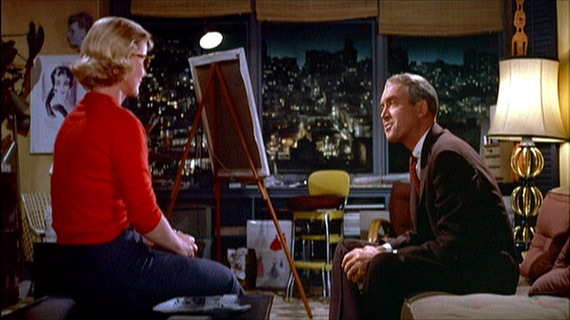 If you haven’t seen Vertigo, stop reading now and watch it, preferably on blu ray. Even better, look for a revival screening to fully appreciate the widescreen cinematography originally filmed in VistaVision. I won’t give away the ending but many other surprises are coming up that I don’t want to spoil. After viewing, you may want to make your own cinephillic pilgrimage to San Francisco. Scottie continues trailing Madeleine/Carlotta. At Fort Point near the Golden Gate Bridge, she tosses a bouquet into the frigid water, then jumps. Scottie goes in after her and pulls her to safety, then puts her into the Jaguar. We next see her waking up in his apartment. 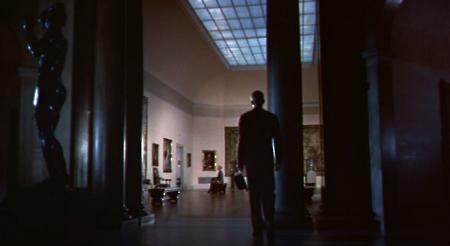 Cinematographer Robert Burks filmed the apartment’s interior on a soundstage. The Legion of Decency didn’t like seeing a brassière or other obvious female undergarments hanging up in the bathroom. 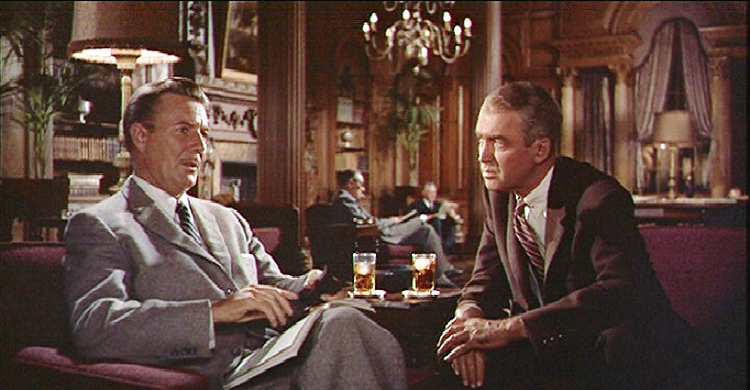 In Vertigo: The Making of a Hitchcock Classic, Dan Auiler described some of the other problems the crew encountered filming this scene, mostly with logistics and timing. They tried an elaborate crane shot for when the phone wakes up Madeleine and Scotty answers. It was later abandoned in favor of something simpler. When Scottie takes a call from Gavin, Madeleine quietly slips out. Coincidentally, Midge pulls up as Madeleine is leaving. Midge is clearly upset seeing her competition. “Well now Johnny-o, was it a ghost? Was it fun?” Midge is reliable but familiar. Madeleine is mysterious, an intrigant. The next day, he continues his surveillance of Madeleine as she drives through the city. She stops at his apartment, getting out of her car to leave a note at his front door. 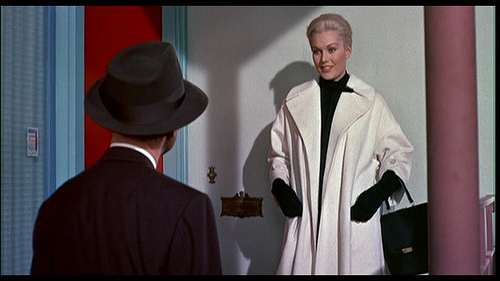 She’s wearing a white coat with black gloves, another fabulous creation from costume designer Edith Head. Scottie arrives. Madeleine says she wanted to thank him for his kindness, apologizing for her abrupt departure. The talk is casual but there’s an underlying tension. They search for a way to justify going off together. Scottie: Don’t you think it’s a waste, to wander separately? Madeleine: Only one is a wanderer. Two together are always going somewhere. Scottie: No, I don’t think that’s necessarily true. The wanderers head down the coast to the giant redwoods in the Santa Cruz mountains, Cypress Point near Carmel and finally to Mission San Juan Bautista where tragedy strikes. As he always does, Scottie returns to Mother. Shattered, with a faraway look, he sits in his room at a convalescent home. Classical music plays but his mind is elsewhere. Even Midge can’t reach him. His “thousand-yard stare” that combat veterans speak of, peers into the abyss. 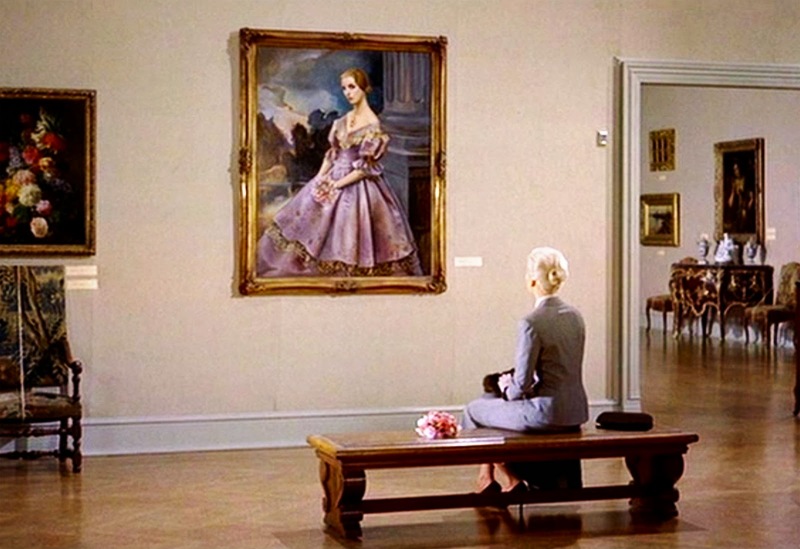 The blank expression contrasts with Madeleine’s reverent gaze at the painting of Carlotta, a memory that haunts Scottie’s dreams. Midge exits the story never to return. Scottie recovers enough to rejoin the living. Because he believes he’s lost Madeleine forever, he’s no longer a happy wanderer but a sad one. 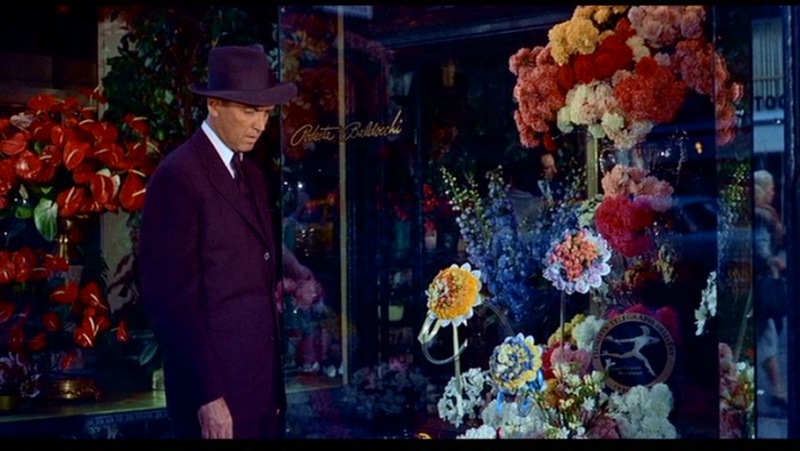 At the flower shop once favored by his love, he resembles the living dead. On his aimless walk around the city, Scottie sees Judy Barton, a department store employee on her lunch break. She’s a brunette, not particularly stylish, but her face is unmistakably like Madeleine’s. With nothing to lose, Scottie follows her to her residence, the Empire Hotel. When he knocks on her door, she asks,”Is this some kind of Gallup poll?” Her voice is brittle and irritating, nothing like the breathy Madeleine. Scottie should be dissuaded, but he sees some raw potential and makes his pitch. She resists but eventually takes pity on her stalker and lets him in. Her room is nothing special, with some feminine touches here and there, the pink lampshade for instance but overall reflects her low status. Scottie isn’t concerned with the decor but has plans to make over her appearance. He succeeds though maybe too well. 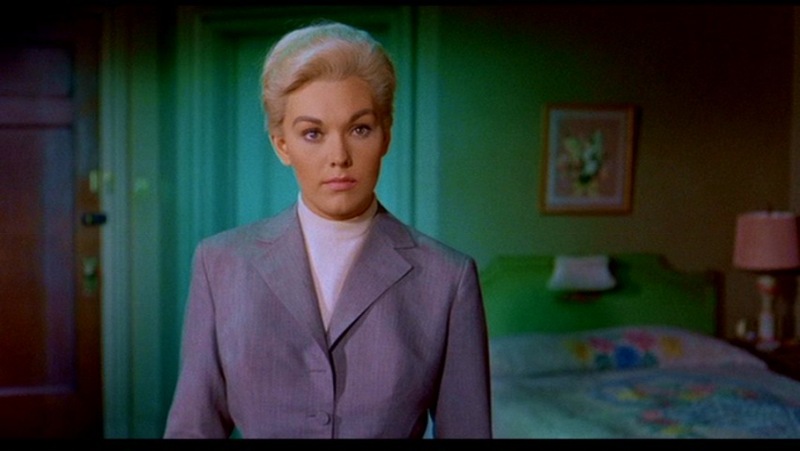 [For more on her transformation, see the earlier post Vertigo’s 3 Faces of Kim]. 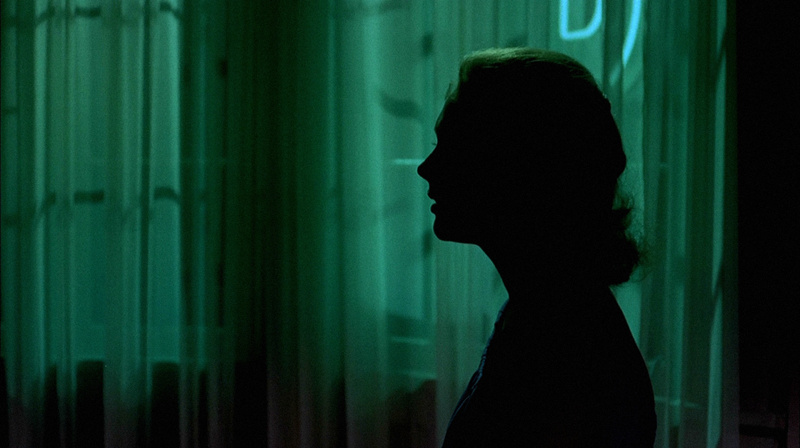 All of these emotional threads come together in the greatest single shot in all of Hitchcock … The great scene takes place in a hotel room, lit by a neon sign. Judy has arrived, not looking enough like Madeleine to satisfy Scottie, who wants her in the *same* dress, with the *same* hair. His eyes burn with zealous fixation. 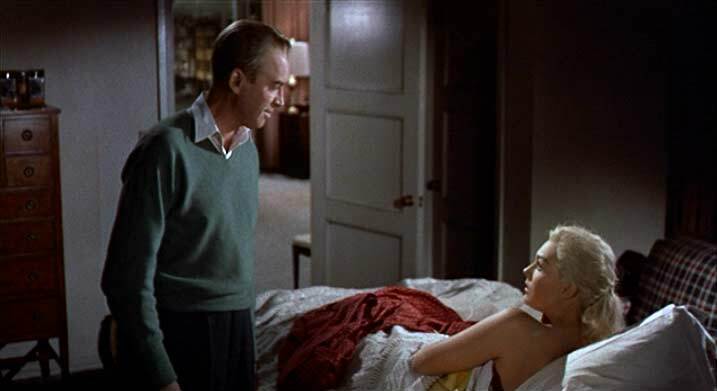 Judy realizes that Scottie is indifferent to her as a person and sees her as an object. Because she loves him, she accepts this. She locks herself into the bathroom, does the makeover, opens the door and walks toward Scottie out of a haunting green fog that is apparently explained by the neon sign, but is in fact a dreamlike effect. The Favorite Classic Film and TV Homes Blogathon continues with a variety of posts on film and television classics. For the complete listing, click on the image. This entry was posted in Blogathon, Movies and tagged Alfred Hitchcock, Barbara Bel Geddes, James Stewart, Kim Novak, The Favorite Classic Film and TV Homes Blogathon, Tom Helmore, Vertigo by crimsonkay. Bookmark the permalink. Thanks for joining us with such a well-researched, interesting post! I actually just finished an intensive Hitchcock course this semester and Robin Wood’s book was required reading. It’s funny that no matter how much we dissected Vertigo, we never realized the similarities between the shot of Madeline coming out of Scottie’s bedroom and the infamous shot of her coming out of her bathroom. It just goes to show that you can always find something new in movies, especially Hitchcock’s. Thanks for having me. You’re right that there’s always something new to discover with Hitchcock and Vertigo. I never caught the mirroring of the bedroom/bathroom scenes before, either. Congratulations on completing the Hitchcock class. I’m looking forward to TCM’s focus on Hitchcock this summer with the companion course. Their film noir series/course last summer was quite good. Great review and illustrations. 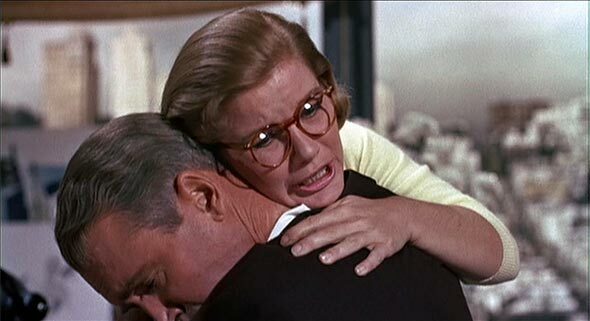 I never understood how shop girl Judy could pull off such an amazing piece of acting as Madeleine. Thanks. I’ve wondered that too. 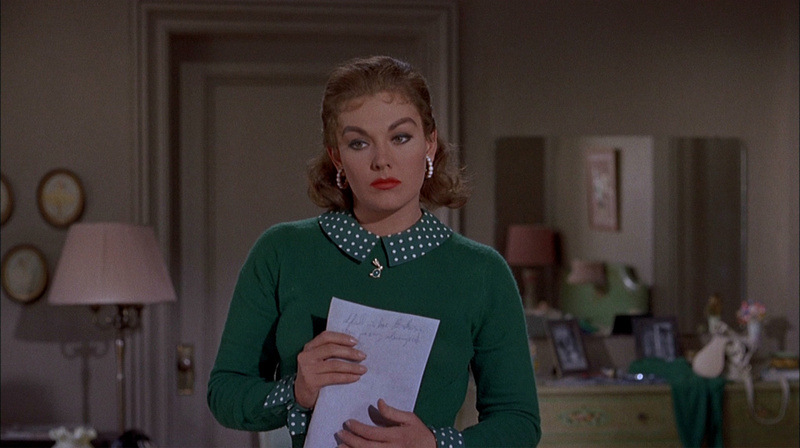 And how or why would she go back to being Judy? I enjoyed your article and learned a great deal. Thanks. 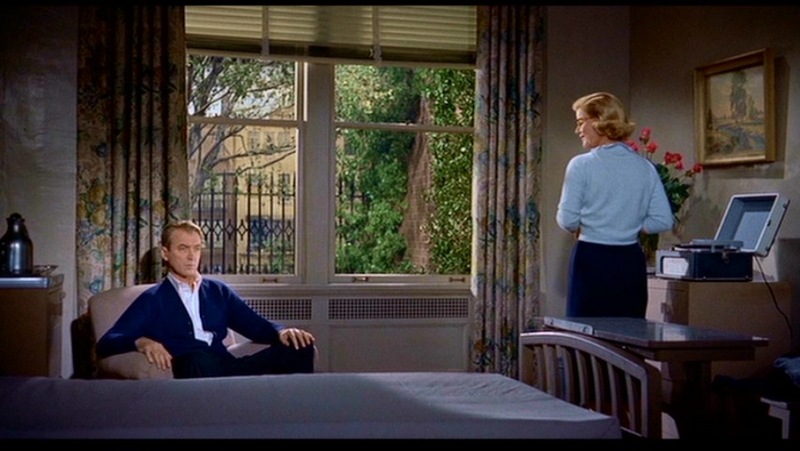 We can never see a film like Vertigo often enough. How true. I’m just starting to appreciate how color is used in certain scenes. Fantastic piece! I loved that you included the bit about Midge’s place, that is so cool and often overlooked. I watched this film again a few months ago, and the colors, cinematography and interior design really called my attention. Vertigo is perfect in every possible way. Thanks! So much in every frame. It was helpful to look to the interior design expert for Midge’s studio. Such a cool post on all the interiors! And I will have to see if my library has some of those books you referenced, especially since I’m taking the Hitchcock class TCM is offering. Thanks for participating in this Blogathon!!! Thanks for hosting! Great idea for a blogathon. The books can be previewed on google books. They’re worth having for reference. I also signed up for the TCM Hitchcock class. See you there.